Anyhow, it’s my turn for the All About Strings Blog Hop hosted by the amazing Carla over at Creatin In The Sticks. If you’ll recall, I also participated in her Black and White Blog Hop a while back during which I designed, then made, this unicorn paper pieced pillow cover for my little girl. The paper pieced pattern comes in a variety of sizes and can be purchased via payhip at this link. You can find my blog post about it here. This hop is all about various projects made with “strings” which are strips of fabric. There’s lots of great ideas that I’ve seen from the others in this hop all ready! You need to go check them out. You can find Carla’s post with the entire blogging schedule here. Now, onto my project. I knew I wanted to do something scrappy (I’m trying to use up all the scraps in my rolling 3 drawer bin…) and use a solid to give it a sense of uniformitity. I was going to use gray, but my pattern calls for 2 shades that are close together. When I went fabric shopping I couldn’t find 2 close shades of gray that I actually liked so I went with my second choice which is deep maroon/wine red. Here’s my finished wall hanging flimsey. I’m going to be doing a string pieced, wide binding on it. But that won’t be until after I figure out how I want to actually quilt this guy. Typically, I just go for it, but for some reason lately I keep getting hung up on the quilting design. It’s not as simple as loading it up and using some computerized or digital design for me. Why? Because ALL of the quilting I do on every size quilt from micro mini’s to oversized king quilts are done on vintage domestic machines – most of the time on either a Singer Touch & Sew from the mid 70’s or my Singer Rocketeer from the early 60’s. Why? because those 2 machines have the largest throat space out of the various machines I own. 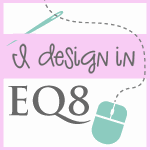 Here’s the design mock up from EQ8. I used the striped fabric to stand in for the strings. While I’ve not yet made a step-by-step tutorial, I have uploaded the pattern for anyone who would like it. Currently, while it is just the paper piecing template that I doodled on, it’s available to download now for free. I hope you’ve enjoyed your visit here with me for my stop on the All About Strings Blog Hop and I hope to see you again soon. Until next time happy creating! Thank you so much Cynthia 🙂 I’m glad I’m not the only one stuck on quilting ideas 😉 I just can’t seem to want to do the same old thing again but I’m limited by my machines. Meh, we’ll see. Good luck on finishing yours! Your wall hanging is very pretty! Great Project. Love the reds. That is an interesting setting for your string quilt. A very interesting and different setting, thanks for sharing. What a dynamic design! Thanks for sharing it with the All About Strings Blog Hop. I agree that the solid color enhances the string designs. Such a great way to use up strings in this sweet project! What a fun block for strings and your quilt top is stunning. Thanks for the block pattern. I downloaded it and will have to give it a try. Thank you, so much, for joining the All About Strings Blog Hop. I know the week you had and I really appreciate your extra effort to get this wonderful post done. Awwwww, thank YOU so much Carla!!! Thank YOU for letting me join in. I’ve really enjoyed it. This is lovely. And I like the striped border on it, it will give it completion. The colors are wonderful. Thank you for sharing and for inspiring today. Also thank you for sharing the pattern. Thank you so much Lori! 🙂 Yes! I’m so looking forward to seeing the scrappy string border on it and have it hanging up. I like it with the reds. Will be checking back to see it quilted. Thanks so much for sharing. Why thank you Mary! 🙂 I’m still pondering the quilting while working on some summer dresses for my girl. Stunning design. Thanks for sharing it with us. Cute wall hanging. I like the solid color fabric with the strings. Thanks Danice 🙂 I like scrappy but I *have* to have something to tie it all together and not be overpowered by the scrappy. Very pretty! I’m sure the quilting will be beautiful any way you decide to do it. Great quilt!! I don’t know how anyone can do any quilting on a DSM!! I’m horrible at any quilting that doesn’t involve my longarm!!! Looking forward to seeing how you quilt this beauty! Thank you Susan 🙂 It’s just a matter of having no choice. LOL Hubby keeps telling me I can get a longarm once we move but that seems to be taking forever. lol Honestly, I’m not sure if I get a longarm or a stationary. Not sure if I’ll be able to transition well from moving the quilt to moving the handles. I’ve tried many at various quilt shows / expos but will be trying more before I make a decision. wonderful string mini, thanks for sharing. Love your quilt. I am really enjoying seeing everyone’s wonderful creations.